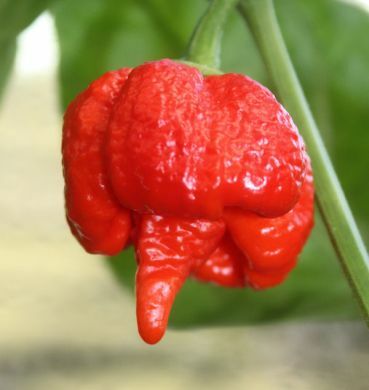 The Butch T Scorpion powder or Scorpion pepper has officially surpassed the Bhut Jolokia pepper as the hottest pepper in the world, the Butch T Scorpion chile (chili) pepper was confirmed as the hottest chile (chili) pepper in the world by the Guinness World Book of Records. The Butch T Scorpion chili powder is rated at 1,469,700 Scoville units. These hot peppers originate from a strain of chilies from Trinidad, an island in the Caribbean. And now the Butch T Scorpion is above them all with a rating of more than 2 million Scoville Units. Buy Butch T Scorpion here in Butch T Scorpion Powder and dried pods.